Although plot or monitoring data are quite often associated with objects collected in the plot and stored in specific collections, controlled vocabularies currently available do not cover both disciplines. This situation limits the possibility to publish common data sets and consequently brings a loss of significant information by combining plot-based research with collection object associated data. To facilitate the exchange and publication of these important data sets, experts in natural history collection data, ecological research, and environmental science met for a one-day workshop in Berlin. The participants discussed data standards and ontologies relevant for each discipline and collected requirements for a first application schema covering terms important for both, collection object related data and plot-based research. Plot sampling is a widely used method in ecology and biodiversity research. These inventories are commonly accompanied with the collection of voucher specimen for e.g. further identification or analysis. Whereas gathered information of plot observations are usually assigned to a plot or a plot observation to a particular time, specimen in natural history collections are managed on unit level with all information and measurements attached to a specimen. Currently there is a variety of controlled vocabularies (thesaurus) available for biological and related disciplines. A set of defined descriptive terms are either arranged in structured data standards or put in relation to each other in an ontology. However, controlled vocabularies designed for a standardized exchange of collection data, e.g. Access to Biological Collection Data (ABCD, Berendsohn 2007 ), might not be efficiently used for plot data. On the other hand ecological vocabularies, e.g. Ecological Metadata Language (EML, ecoinformatics.org 2011 ) might not sufficiently cover information about the storage and preparation of physical collection objects. A combination of both disciplines might be rudimentarily expressed using the Event Core (https://terms.tdwg.org/wiki/Darwin_Core_Event) of the taxa based standard Darwin Core ( Darwin Core Task Group 2015 ) or particular ABCD terms (MeasurementOrFact, https://terms.tdwg.org/wiki/abcd2:Biotope-MeasurementOrFactAtomised), but whether these options allow for an adequat representation of the plot observation event has not been evaluated. Controlled vocabularies for the natural history as well as ecological and environmental science have been developed in separated domains, despite their huge amount of overlapping terms. Both disciplines need to describe properties such as locality, (taxonomic) determinations, species traits, project metadata, involved persons and their affiliations etc. In practice there are examples in which the disconnection of the vocabularies might cause issues regarding data management and interoperability, and in which none of the data standards can be applied adequately. Hence, researchers need a comprehensive and flexible standard schema that also defines the relations between the standards of both domains. Within the scope of the research and service project “ABCD 3.0 – A community platform for the development and documentation of the ABCD standard for natural history collections” *1 (https://abcd.biowikifarm.net/) all ABCD terms were imported into the TDWG Terms Wiki (https://terms.tdwg.org/wiki/ABCD_2), a developmental platform which allows collaborative work of the terminology and the schema itself. Here, also relationships including their specifications ("is part of", "perfect match") with other vocabularies or direct translations of terms can be added. This enables the application of ABCD, a direct review, and further development by scientists of different disciplines. Currently the XML-based structure of ABCD is being changed into a semantic form embedding missing terms derived from external, already existing ontologies. In close cooperation with the scientific community, application schemata for particular use cases are formed (compare Petersen et al. 2019 ). In addition to (technical) mandatory elements and elements of general importance, application schemata comprise parts of the ABCD schema relevant for specific purposes; i.e. discipline, collection, or for the publication in a particular data portal. Thus it is a defined subset of concepts available in the whole ABCD schema and if necessary supplemented with concepts from other standards. 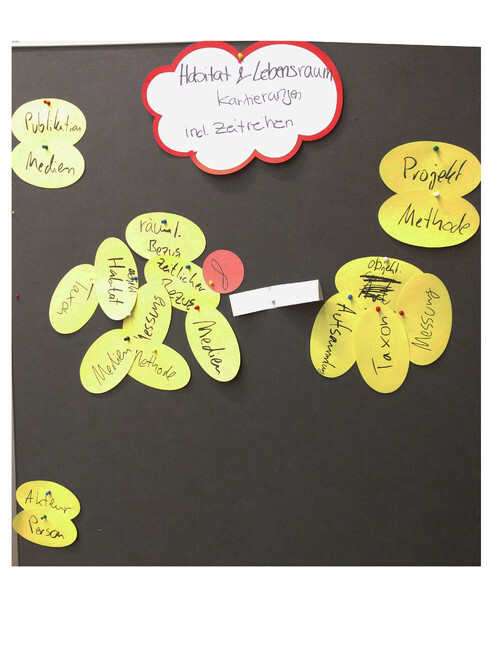 The workshop was carried out in the framework of the ABCD 3.0 project, a colloboration of the Museum für Naturkunde Berlin and the Botanical Garden and Botanical Museum Berlin Dahlem. During the workshop experts of natural history collections, biodiversity standards and ecological/environmental science met in order to share their experience and collect their requirements for the publication of plot-based data. The participants examined different domain-specific vocabularies and discussed terms necessary to describe plot-based research data including e.g. habitat characterization, time series, monitoring, and the collection of sample specimen. The workshop's results are presented in this report. Furthermore necessary tasks towards an application schema for plot data were discussed and are documented here. The workshop intended to evaluate whether the standard ABCD fulfills all demands and whether other domain-specific controlled vocabularies contain appropriate, supplementary terms for the publication of plot-based data. The aim for the one-day meeting was a first version of an application schema linking collection objects with plot-based research. The workshop program included a short informative and an extensive interactive part (see Suppl. material 1 ). After a general introduction, all participants were asked to introduce themselves and describe their experience with controlled vocabularies. The organizers gave an overview on existing vocabularies, including different data standards and ontologies, associated with plot-based research and collection data prior to the working session. In small groups the participants delved deeper into Extensible Observation Ontology (OBOE, Madin et al. 2007 ), Observation and Measurements ( Cox 2013 ), Humboldt Core ( Guralnick et al. 2018 ), Veg-X (exchange standard for vegetation-plot data, Wiser et al. 2011 ), and Ecological Metadata Language (EML, ecoinformatics.org 2011 , Fegraus et al. 2005 ). The participants were asked to check the standards and ontologies for adequate terms in order to model plot-based data and, if possible, to map information associated with objects gathered on the plot and subsequently stored in a scientific collection. The respective findings were presented and discussed with all participants. In the last section, the workshop focused on the first steps towards an application schema for plot-based data and considered essential information, their relation to each other, and whether they are used once or multiple times (cardinality). It was shown, that plot-like data, e.g. DNA samples, can be expressed with ABCD and its extension GGBN ( Droege et al. 2016 ). The concepts to describe the accruing information are available, but the hierarchical XML structure is limiting the mapping possibilities. This difficulty became even more clear when considering the different record types (lots vs. single specimen) in research projects investigating biodiversity (e.g http://www.indobiosys.org/). The workshop participants collected further use cases common in plot-based research and which therefore should be considered preparing a discipline specific application schema, such as environmental sample (incl. chemical properties), plot properties and vegetation characterization (incl. vouchers), habitat / biotope mapping, or monitoring of plots (time series). Keeping these use cases in mind, the participants analyzed existing controlled vocabularies with respect to adequate terms covering the required information. The ontologies OBOE and Observation and Measurement are more generic and allow the representation of manifold data types derived from plot-based research. Although both ontologies should be taken into consideration when establishing an ontology on plot-based data, some terms might need a more precise definition for the particular use cases discussed during the workshop. Humboldt Core represents a list of terms for ecological inventories but is not yet a ratified standard. Data related to the sampling event itself (locality, time), the procedure, and the general scope of an inventory can be perfectly expressed with terms described therein. In case any collection object centered standard (e.g. ABCD) needs to be extended for plot-based research, one should make use of and refer to the well-defined Humboldt Core. Veg-X is an XML based standard mainly produced for vegetation-plot data. It is structured into several data components such as fixed information about plot (e.g. altitude, slope), plot observation, and observed organism, etc. The most innovative part of the Veg-X standard and potentially re-usable for the discussed use cases in our workshop is the plot observation. Other parts of Veg-X are already adopted from other standards including EML (for protocols and projects definition), Darwin Core (for geo-data), and Taxon Concept Schema (taxon names). EML describes the essential aspects of ecological data covering e.g. the general dataset, geographic and temporal aspects, and methods. For the purposes discussed during the workshop, EML terms could be valuable for the general project description and for the specification of methods and should definitely be taken into consideration for plot-data application schemata. Following this, participants were asked to compile thematic use cases for plot-based research. Eventually, it was agreed to collaboratively work on a single, more general use case: the mapping of a habitat or biotope including multiple visits (time series). In a closing discussion session all relevant concepts were collected, their relationships to each other were considered, and the cardinality of each concept was reasoned. Fig. 1 and Table 1 give details on the terms incorporated in a first version of an application schema for plot-based data. Concepts of a first version of an application schema for plot-based data in combination with collection objects. Given are concepts discussed during the workshop and which should be incorporated in an application schema (compare Fig. 1 ). In addition to a short description we assigned the cardinality to each concept. Various concepts are of importance for the plot research as well as for the description of the collection object (e.g. measurements, associated mulitmediaobjects, people conducted research etc.). First version of an application schema for plot-based data. Shown is a list of terms, their relations, and partly their cardinality important for habitat and biotope mapping (status: 30 May 2018, end of the workshop). Given is the flipchart diagram created during the workshop (see Table 1 for english translation of terms). The core of this first version of a plot-based application schema consists of a spatial concept, a concept related to and describing the location. A temporal concept, e.g. describing one plot observation or a measurement at the plot to a specific moment in time, is closely related and repeatable. Multiple other properties such as associated media or other measurements and the performed method can be related to this concept. During each plot visit the observation and/or the gathering of specimen could occur and should be recordable. The specimens themselves are accompanied with information about their taxonomy, individual measurements etc. and, in case of collection, any identifier and further information about the storing collection. Due to time limitation, it was not discussed how these concepts could be related to the direct plot measurements. These relations and other relevant terms mentioned during the discussion (e.g. project metadata, associated publication, and person) need to be addressed subsequently. According to the set of vocabularies investigated during the workshop Veg-X seems to be the most promising standard covering various information necessary for the discussed use cases. In order to have a deeper look into the standard, to evaluate the overlap of terms, and to assess the possibility to extend ABCD with terms derived from Veg-X a mapping between ABCD and Veg-X is required. ABCD allows the representation of plot and plot-like data to some extent, but its structure currently limits the usability and impedes the publication of proper plot data in important portals such as GBIF (https://www.gbif.org/). Due to new developements, ABCD is no longer fixed in its hierarchical and collection object centralized form. This will facilitate the link to other appropriate vocabularies and to draw application schema for different plot-based research questions. On the other hand, the maintainers of other data standards should prefere to re-use appropriate ABCD terms over creating new terms as soon as they are going to extend their schema towards collection objects. Thus the development of a real application schema for plot-based data should be done in collaboration. The list of terms collected in this workshop will however serve as a guideline for the publication of plot data in the meantime and later on in consensus with experience in plot-like examples (e.g. sample with environmental DNA) and knowledge using ABCD over the last years ( Holetschek 2015, Holetschek 2016, Petersen et al. 2018 ) be incorporated in the developement of application schemata linking collection objects to plot research. The workshop was supported by ABCD 3.0, a DFG project funded under the LIS infrastructure platform. We thank G. Dröge for her inspiring talk and all participants for their valuable contribution and constructive comments on an earlier version of the report. The publication of this article was funded by the Open Access Fund of the Leibniz Association.
. http://ontolog.cim3.net/file/work/OntologyBasedStandards/2013-10-17_Ontologies-for-Geospatial-Standards/Observations-n-Measurements-OWL--SimonCox_20131017.pdf. Accessed on: 2018-8-15.
. http://rs.tdwg.org/dwc/terms/. Accessed on: 2018-9-19.
. https://knb.ecoinformatics.org/#tools/eml. Accessed on: 2018-8-16. Humboldt Core–toward a standardized capture of biological inventories for biodiversity monitoring, modeling and assessment.
. www.biocase. org/whats_biocase/concept_survey.cgi. Accessed on: 2018-8-21.
. http://wiki.bgbm.org/bps/index.php/CommonABCD2Concepts. Accessed on: 2018-8-21. Authors: M. Petersen et. al. ABCD 3.0: Funded by the German Research Foundation (Deutsche Forschungsgemeinschaft), Scientific Library Services and Information Systems; partners: Museum für Naturkunde Berlin (MfN) and Botanical Garden and Botanical Museum Berlin Dahlem (BGBM).